Of Tear Gas Used on Occupy Wall Street, UN Says Oakland "Acted Responsibly"
UNITED NATIONS, November 3 -- The day after police used tear gas in Oakland, California to put down an Occupy Wall Street protest for second time in eight days, Inner City Press asked United Nations spokesman Eduardo Del Buey is anyone in the UN is tracking this and if the UN thinks the responses in Oakland have been proportionate. "Obviously the fact that tear gas was used, the authorities thought that tear gas had to be used," UN spokesman Del Buey said. Video here, from Minute 14:55. This is a strange logic for the UN, that if "the authorities" do something, they must have thought it was necessary -- and it must therefore be justified. The UN does not use this approach elsewhere. Del Buey said that the mayor of Oakland "apologized" for the first use of tear gas, which fractured the skull of US veteran Scott Olsen with a police projectile, "so we believe the authorities are acting responsibly." Elsewhere, the UN does not say that apologizing is enough, or means that authorities are "acting responsibly." 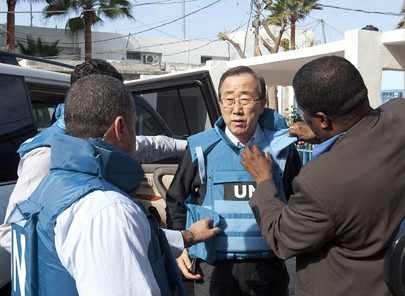 All three times, so far, that Inner City Press has asked the spokespeople for UN Secretary General Ban Ki-moon about authorities' responses to Occupy Wall Street it has begun by acknowledging that the violence used is qualitatively less than in countries like Syria and Yemen, both of which Inner City Press asked about at the UN on Thursday. So what standards does the UN have and apply in the US? Consider that Ban Ki-moon named as the co-chair of his High Level Group on Sustainable Energy for All Charles Holliday, chairman of Bank of America, protested by Occupy Wall Street for being the number one funder of moutaintop removal coal mining. Earlier this week Ban's spokesman Martin Nesirky went out of his way to allow any other question -- including about UNESCO -- rather than Inner City Press' question about sustainable energy and Ban's Bank of America nomination, click here for that story. Now the UN says using tear gas, including dangerous projectiles, against Occupy Wall Street is "acting responsibly." Is it time to Occupy the UN? Watch this site.